Welcome to Blackbird's Country Inn. 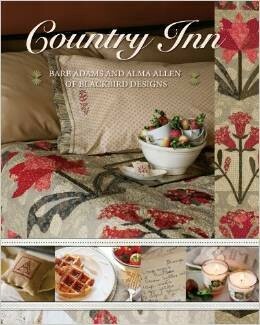 Come in, sit down and stitch with Barb Adams and Alma Allen. In addition to the lovely nine-block applique quilt shown in two different color ways, you'll find seven projects, including lavender sachets, a pin cushion and monogrammed pillowcases. Two pieced quilts,Sweet Thing and Country Charm, can be stitched together quickly for a gift. Bachelor Buttons andShooting Stars are appliqued quilts that will win your heart. Henry, the gardener, and Anna, the cook, invite you to stay as long as you like. Anna has some wonderful breakfast recipes to share with you. 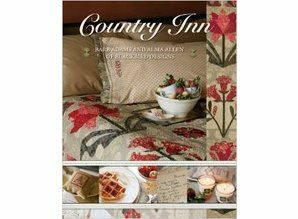 So relax and enjoy yourself in this Country Inn where your applique stitches don't have to be perfect and it's okay if all your points don't match. It's the friendship that counts here.